Reservations are being taken now, prime dates are still available! Yes Bay Lodge's office is located in Ketchikan in the West Flight Building and is available during the summer season 7 days a week, during normal office hours 8:00 am. to 6:00 pm. Alaska Standard Time at the address and numbers listed below and to the left. During the winter months the office is open Monday - Friday 9:00 am. to 5:00 pm. Employment - A great Summer of Adventure! Thank you for your interest in working at Yes Bay Lodge. 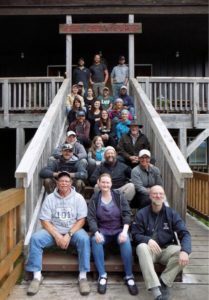 In General, Yes Bay Lodge employs 25 individuals throughout the summer, filling a variety of positions. Our season runs from approximately June 19 through September 24. It is very important that each employee is available to work the entire season. You may fill out the on-line application along with sending current resume and references. If your qualifications are what we are looking for we will arrange an interview in regards to the 2019 summer.